Jackie Robarts is a professor of music therapy at the Guildhall School of Music & Drama, London. She has many years of training music therapists both at the Guildhall School, at Nordoff Robbins London, and abroad. She is an HCPC registered Music Therapist and a member of the British Association for Music Therapy. 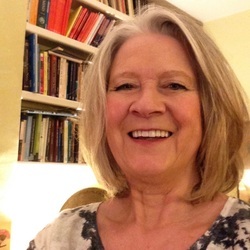 She enjoys teaching and supervising experienced and newly qualified music therapists, as well as teaching clinical improvisation and improvised song creation. Jackie's background includes working with a wide range of children, adolescents, and adults in the NHS, and at Nordoff Robbins Music Therapy Centre, London. For many years she has also worked with musicians and other creative artists in the area of wellbeing and mental health. Jackie's clinical and research interests in musical intra- and inter-personal processes of symbolisation (creation of meaning) and mentalizing in music therapy are grounded in her long-term work with children and adults with developmental and mental health problems, including histories of early trauma, abuse & neglect, attachment problems, autism and related conditions, such as eating disorders, and selective mutism. Her research was funded by The Music Therapy Charity and by The City University, London, where she was a University Research Fellow (1998-2002). Jackie has published papers and chapters on clinical and theoretical perspectives in music therapy. She has given many conference presentations alongside leading researchers and clinicians in the fields of autism, abuse & early trauma, eating disorders, developmental psychology and child psychotherapy.